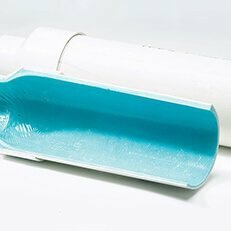 Although there are many methods of sewer pipe repair or replacement, epoxy pipe lining remains one of the most popular. This trenchless form of pipe rehabilitation uses high performance epoxy resin to create a seamless pipe within the existing, damaged pipe. The professionals at PrimeLine Replacement offer the highest quality resin that is ideally suited for use in many applications. The special type of pipe lining epoxy used for trenchless applications is incredibly durable. The PrimeLiner® Resin used by the experts at PrimeLine Products is not only structurally strong, but it is chemical resistant. The material is almost impenetrable to root intrusion, corrosion, or any of the other common problems that create inconsistencies in standard metal piping. Epoxy is a Cost Effective Repair Solution. When determining epoxy lining cost, many factors are to be considered. Not only is pipe lining less expensive than traditional excavation methods, the trenchless technology employed saves the consumer money in recovery costs. Because trenchless methods take a no-dig approach, you won’t have to pay to repair a lawn or landscape that may have been completely destroyed if standard methods were used. The epoxy resin used for trenchless sewer rehabilitation begins as a liquid. The aqueous nature of the resin can easily form to any size pipe, resulting in a seamless lining once it is set and cured. Although it is set inside the old pipe, the resin hardens to an independently strong material that does not rely on the old pipe for structural strength. If your pipes are in need of a complete rehabilitation, consider the strength and durability of epoxy resin for a lasting solution to your sewer line problems. Contact us today for a quote or any additional information regarding your next project.